Crafted by perfume experts with a blend of perfume oils. Long lasting, Luxurious Fragrance. Leaves your laundry brilliantly clean. An uplifting blend of Vanilla with Orchid and Ylang Ylang. Approved by Good Housekeeping Institute. Also available in liquid and capsules. Surf Sensations Golden Blossom is infused with the luxurious fragrance of Vanilla with Orchid & Ylang Ylang in its top notes to create a light and floral start. It's elegant yet complex fragrance develops over time through sweet notes of golden Apricot with a twist of citrus which maintain a freshness and vibrancy that's guaranteed to awaken your senses. 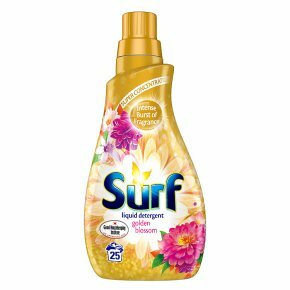 Surf Sensations Golden Blossom with its elegant fragrance is available in washing liquid, washing powder and washing capsules and is suitable for washing both colours and whites. The Surf Sensations range is infused with the finest fragrances crafted by perfume experts. Each has a unique blend of perfume oils to awaken your senses and lift your mood, giving your laundry a luxurious fragrant freshness and brilliant deep clean. Surf capsules are extremely easy to use, efficient and convenient for your busy life. Simply pop a single capsule at the back of your washing machine's drum, add your laundry and enjoy the great results of brilliant cleaning and excellent fragrance. For the best results, use one capsule for standard soiling, soft/medium water and a standard load (3-5kg). Use two capsules for heavy soiling, hard water or a larger load (6-8kg). Top Tip: If you notice residue from the laundry capsule on any items of clothing, do not place them in the tumble dryer. If the residue is not rinsed out of the fabric before drying, this could cause permanent staining.